Mata Amranananthamayi the great spiritual personality lovingly known as Amma or Ammachi, belongs to Kollam, Kerala. Earlier named as Sudhamani, she was born on September 27th 1953 to parents Sugunandan and Damayanthi. Amma mostly draped in a white sari with her loving smile and her healing touch, has a huge number of followers both in India and abroad. 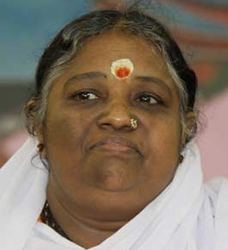 'Mata Amritanandamayi' means 'Mother of Immortal Bliss'. Her devotees believe her to be an incarnation of the Hindu Goddess Kali. Sudhamani belonging to a poor fishermen family in rural Kollam had only primary education. She never had a spiritual mentor or guru, nor was she exposed to any philosophical books. Her immense love for fellow human beings and compassion to those who were in need sowed the seeds of what would become her eventual mission. Her parents says that the child had great concern for the poor, though their own family was barely subsisting. In 1975, during a religious reading in the neighborhood, Sudhamani had a vision and showed her 'Krishna Bhava'. From then onwards she completely devoted herself to serving humanity. Slowly people began to flock to the village and seek her blessings. But there was opposition from her family and outside. So she started a small seaside hamlet where some of her disciples left their families and came to live with her. The Vallikkavu ashram, now called Amritandanmayi Math started off in 1981 as a soul-soothing spiritual tourism spot. Amma would console her visitors by cradling them in her arms, listening to their problems, gently stroking their backs, and often whispering soothing words in their ears. The math is now the self contained headquarters of an international charity organization with towering quarters for devotees. It has branches in many Indian cities and has centers in several Asian countries, the US, Europe, Mauritius and Reunion Island. Today her efforts has broadened worldwide with Mata Amritanandamayi Mission Trust being the headquarters to the various charitable projects such as Amrita Niketan (orphanage), Amrita Balamandiram (hostel for scheduled caste students), Amrita Bhavanam (hostel for tribal children), Amrita Kripa Sagar (hospice for the terminally ill cancer patients), Amrita Medical Centre and Amrita Medical Mission of Ayurveda etc. being some of them. The trust has built 25,000 houses for the poor in 12 Indian States. In 1993, Amma was one of the three people who represented Hinduism at the Parliament of the World's Religions in Chicago. In 2002, she won the Gandhi- King Award for Non-violence. Amma with her special aura of sanctity travels around the country and abroad, giving 'darshan', bringing solace and peace to an increasing number of devotees black, brown and white, with her divine hug.